Lucy Ardena Butterfield (1871-1955), Ida Rachel Butterfield James (1875-1966), and Walter H. James (1873-1963) grew up on family farms, the girls in Dunstable, Massachusetts (near Lowell) and he in Portsmouth, New Hampshire. Dena stayed with her aging parents in Dunstable until 1920 and made her living as a seamstress to fashionable ladies. Both Ida Rachel and Walter went to Boston to complete their educations, at Bryant & Stratton and Massachusetts Institute of Technology (MIT or Tech) respectively, and met at a Boston church group while working in Boston about 1897. Married in 1899, they were young professionals, she a secretary at the William E. Putnam Shoe Company and he teaching at MIT. Still valuing their country roots, they, like many who now live in or near the cities, made trips to the woods and mountains for recreation and spiritual nourishment, though their recreational vehicle was a horse and buggy, and their backpacks were, at first, unwieldy blanket-rolls and later simple A.M.C. bags. The editors are the grandchildren of Ida Rachel and Walter James, whom they called Gubby and Gramp, and the grand-niece and grand-nephew of Lucy Ardena Butterfield, whom they called Aunt Dena. Ben : For as long as I can remember, I have been aware of, and in tune with, the spirit of Nature. My grandmother was most influential in helping with bird identification, and she started me on my Life List of Birds. Even before "real mountain" hikes, I often took short walks and observed trees, rocks, terrain features, and vegetation. During the three seasons that I worked on the A.M.C. Trail Crew, I was introduced to many, new trails and locations. My grandfather and I discussed and compared places that he and I had been to more than fifty years apart. In September of 1959, I completed the list of White Mountain four thousand-footers. Recently, I have been referred to as a view enthusiast. Nowadays, I hike at a slower pace. I still look and observe, perhaps taking in more than I did fifty years earlier. And it is a grand feeling to traverse the same trails that my grandparents tramped on a century ago. Jane: I climbed my first mountain, Mt. Cardigan, in 1947 when I was 5. Participating in the A.M.C. 's second Mountain Leadership Training in 1961 led me to spend several summers leading hiking trips at girls summer camps. After earning a Ph.D. in physics at the University of Wisconsin, I instead became a photographer, living in various mountainous places, including at the foot of Pikes Peak in Colorado and of Mount Shasta in California. My photographic work is inspired by the many hours I spent as a child in the woods and fields near our home in Topsfield, MA, both alone and with my grandparents, parents, and brother. I remember many spur-of-the-moment family picnics in the woods, often including Gubby and Gramp after 1949, when they moved to a house just up the road from us. 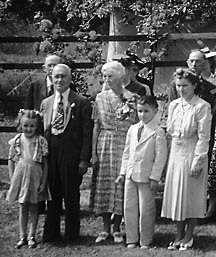 This photo was made at Ida Rachel and Walter's 50th wedding anniversary in Topsfield, Massachusetts on June 20th in 1949. In the front row, left to right, are Jane English - age 7, Walter H. James - age 75, Ida Rachel James - age 74, Ben English, Jr. - age 9 and Ruth James English - age 41. The tent tied to the apple tree behind the rose trellis is Ida Rachel and Walter's old A-tent that had seen many a camping trip. Jane had been given the use of it for playing in the back yard.